It all started with a long-weekend. Jon and I were thinking about getting out of town, but the emergency management folks at work were warning of a winter snow event (why can’t they just say snow?) that they promised would be starting Friday night. So we decided to stay home. Well, it didn’t start Friday night. Saturday morning we got a few snow flurries, lasting a total of about 5 minutes, and never sticking. 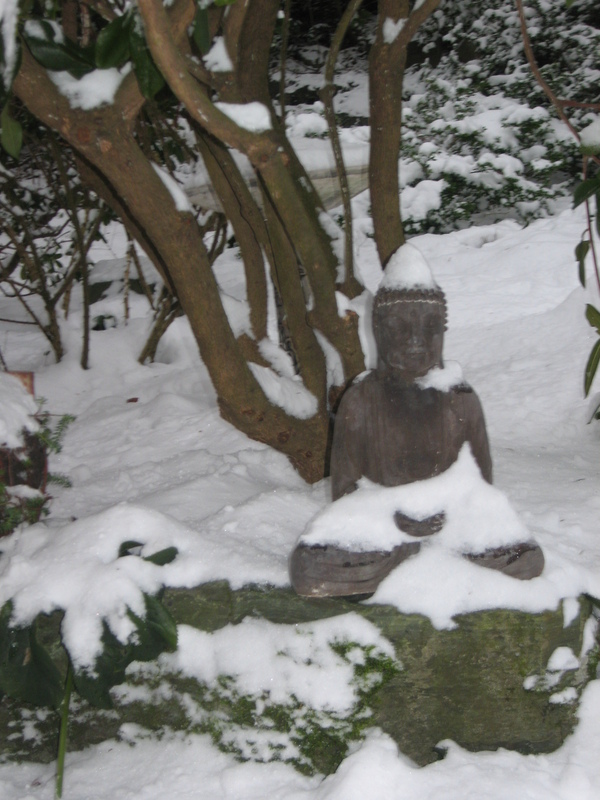 Sunday – we finally got the snow we were promised… about an inch. It was completely underwhelming. Jon and I walked downtown and the closer we got the bay, the less snow there was. I was feeling foolish for listening to the emergency management folks at that point, honestly. Monday was more of the same… in the morning. Again we walked downtown and it was pretty non-“event”ful. But, at that point it was beginning to ice over. We live near the top of a large hill, on a dead end portion, so we will never get a city plow, salt truck or even sand. We decided to try to park our Honda CRV at the bottom of the hill to make it easier for Jon when he went to work in the morning. His car is useless in snow, so we had already decided that he would take my car and I would walk. Well, the hill wasn’t having any of it. 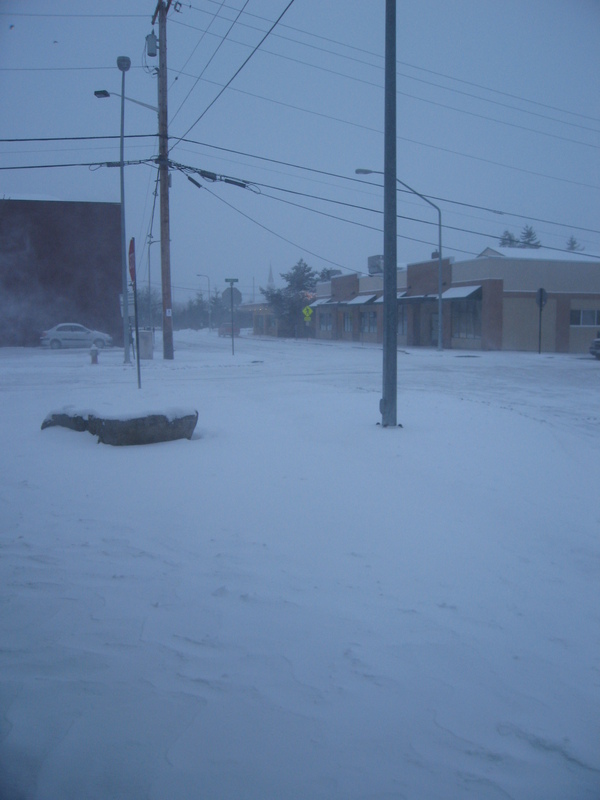 We got about 10 feet down the street before we started sliding sideways, into the intersection (don’t worry, it’s not a busy intersection at all). I was able to get the car back under control, but the problem was that we still had 4 more blocks of a very narrow street (one lane) with cars parked all along the side. So we changed the plan – Jon would hitch a ride to work with a coworker who had no large hills to navigate and I would walk. Monday night into Tuesday we got about 6 more inches of snow – we had a total of about 8-9 inches. It was a great opportunity for me to break out my new hikers! I had gotten some new Merrill hikers last summer on clearance, but with the home selling and buying and moving, we hadn’t had any time to actually go hiking. So I got to march myself through 8 inches of snow (that’s a good quad workout with all the high stepping) the 1.5 miles to the office. I bundled up, so it wasn’t so bad, and my hikers were very good at preventing any slipping on the ice. Again, the closer I got to downtown, the less snow had fallen, so by the time I got close to the office, there was only about an inch on the ground. So strange that it can be so different only a mile and a half away. I love the sound on the city in snow, where there are few cars on the roads and all the noise is muffled by the fluffy, white sound barrier. Tuesday evening I met Jon at the Y where he went to work out after work (he walked there) and we walked the rest of the way home together. It was quite nice. Wednesday’s walk to work was entirely different. The snow was all still there, but now I was contending with a frigid north-easter with winds of 20-30 mph and gusts up to 50 mph. I knew the wind was whipping, so I bundled even more. I had a headband over my ears, two hats, long underwear top and bottoms, shirt, sweater, fleece and winter coat, plus jeans, wool socks and my warm hikers. Add to that a scarf, gloves and mittens over the gloves. I was a real Nanook of the North! When I passed the bank temperature display, I found out it was 12 degrees – yikes. I ended up at work mostly toasty, but with the front of my thighs cold, my cheeks freezing and mascara running down underneath my right eye (note to self: don’t wear mascara in a snowstorm with a north-easter. Lesson learned). I cleaned up and went to work. Work was pretty quiet, so it was a nice respite from the usual hectic-ness. The wind died down and the sun even came out for a bit – it looked quite pleasant from my window! Then we got an email at 2:05 saying that we were closing at 2 (Huh?). Well, I’ll take what I can get, so along with everybody else, I wrapped up what I was doing and shut down for the day. My coworker drives by my street on the way to and from work, and she offered to drop me off at the bottom of my hill. I got home before 3, and Jon and I were able to walk to the grocery store and get some essentials before it got dark. Thursday stayed cold, but with a significant warm-up from the day before. The bank I pass on the way to work said it was 19. The wind was much milder, so it felt downright balmy compared to the ice face washing I had received 24 hours before. Thursday’s walk home was toasty too. The warm-up came on Friday. The weather report was for the rain to start as freezing rain about noon, and there were concerns about flooding and hazardous driving conditions. As it turned out, there the rain was never freezing, and while it did wash the snow off the layer of ice below, it seemed to only make for more treacherous walking conditions. I hitched a ride to the bottom of my hill with my coworker again, and only had to trudge up those steep 4 blocks. 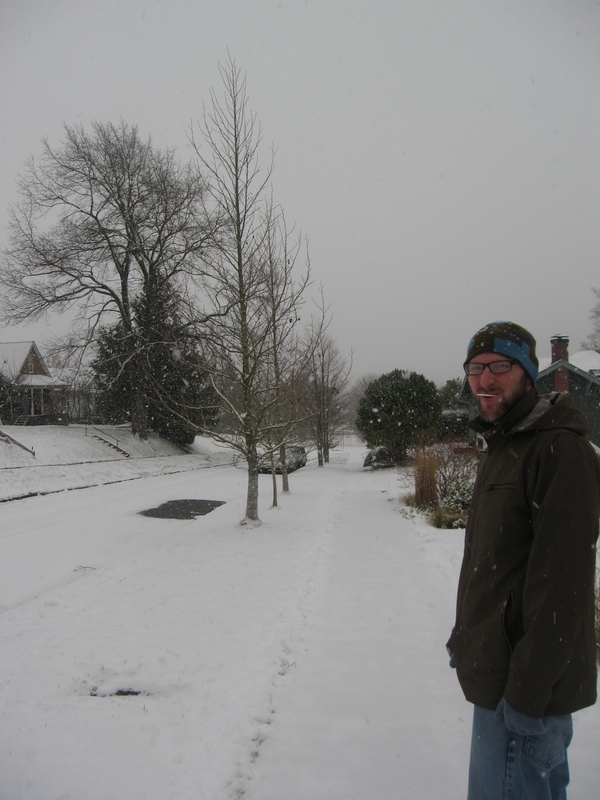 Ironically, Jon had gotten the car out of the garage in the afternoon (enough of the snow had turned to slush), and he passed me in the car as I was walking up the hill. I saw him coming, waved at him to pick me up, and watched as he kept right on driving past me! When he got home, he called to ask where I was! And that, dear readers, is how “Winter Snow Event 2012” concluded. With that, and a much deserved glass of wine. 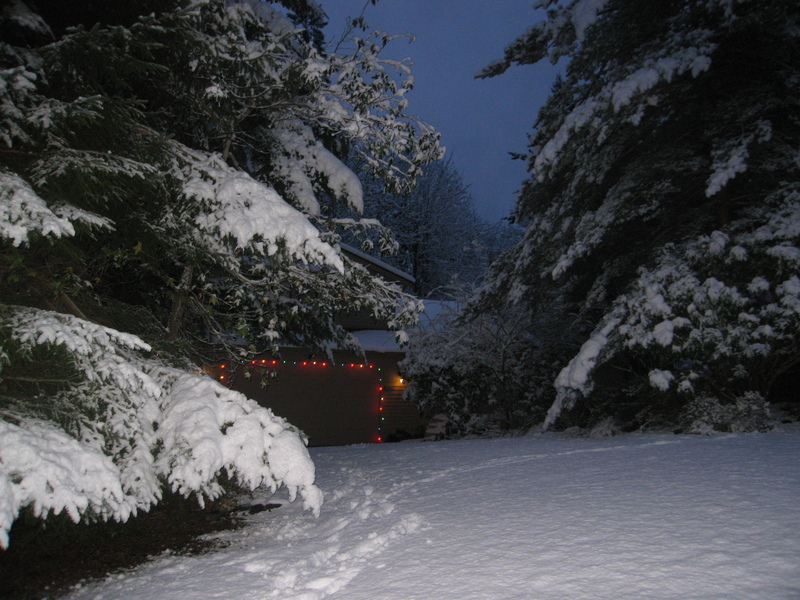 Snow… or not… and Pinot! It’s the three day weekend, and I was told there would be snow. Apparently that promise meant everybody in the county would get snow, and even other parts of the city would get snow, but there would be 1/8 of an inch at my house. Not even enough to make a snowball! If I’m going to hang around home on a three day weekend at least make it worth my while! Jon was sweet enough to rent The Help from the Redbox. It seems fitting to watch a movie with a civil rights theme on Martin Luther King, Jr. weekend. I’m sure he wasn’t that into seeing it, because it is advertised as a chick flick, but I had commented about it before, and he remembered. He even watched the whole thing! We decided to open a nice bottle of Pinot, because we have been missing the Willamette Valley so much. I picked a 2008 Winemaker’s Cuvee Pinot Noir from Panther Creek. This is one that we picked up on sale at Safeway when we were down visiting my brother. Safeway has a pretty good 30% off wine sale a couple times a year and if you buy 6 bottles, you get an extra 10% off. We had no idea whether it would be any good – but wow are we ever impressed. This is a robust Pinot, with a darker black cherry color than many Pinots (a lot of them are more raspberry colored). It has great structure and is a bold, earthy flavor mixed in with ripe berry and coffee. It is solid enough to hold it’s own with a meal, or drink it alone. You won’t be disappointed! We were close to Panther Creek before on a trip to the Willamette Valley, but ran out of time and weren’t able to visit. I know that they make several single vineyard Pinots too, plus it is housed in a cool, historic brick building, so I’ll make sure we visit on our next trip down! 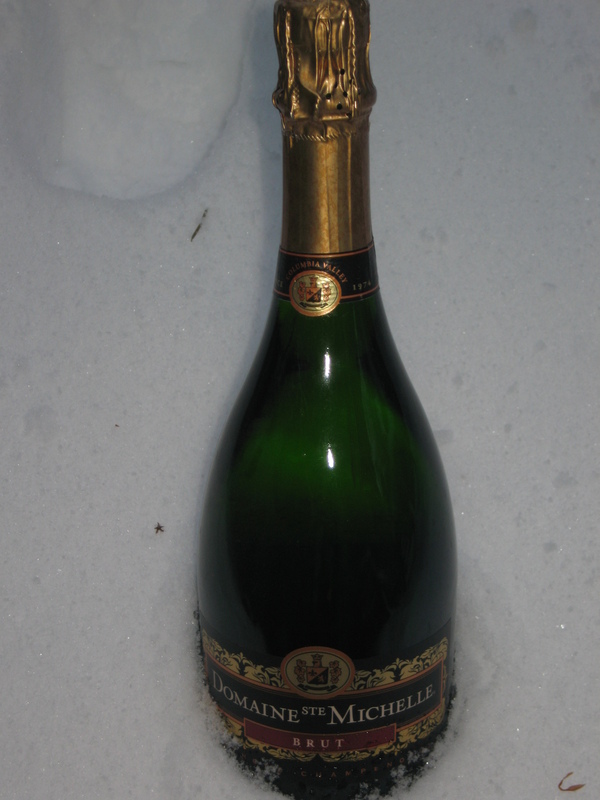 Especially since that was our only bottle…. Until next time! I got to the barn when the vet had just finished trying to insert a nasogastric tube up Biz’s left nostril. She couldn’t get it in – kept getting it into his lung instead of his stomach. She tried the right side with no success either. Meanwhile, I got the lowdown on the afternoon’s progression. Biz came in from his paddock and started pacing in his stall, laying down and rolling. Pretty classic colic signs – which can be fatal in horses. In fact, it is the leading cause of premature death in horses. Colic is basically a symptom, and can have numerous causes. When a horse gets an upset stomach, because they can’t vomit, their urge is to lay down and roll. That can cause a twist in the intestine that cuts off blood flow and causes a section of the intestine to die. At that point, without surgery (and lots of times even with surgery), colic is fatal. So it is really nothing to mess around with. My mom took Biz out into the arena to walk and he lay down there too. She told me he was lying on the ground stretched out with his eyes half closed like he was in a lot of pain. They got him back up and kept him walking until the vet got there. The vet’s exam showed that his heart rate was low (about 24 beats per minute) his temp was normal, and his capillary refill time was slow – indicating that he was dehydrated (thus the attempts at the nasogastric tube). She gave him a painkiller and an anti-inflammatory and tranquilized him to put in the tube. That’s where I walked in. After the tube failed, Biz was prepped for a catheter. I have enough experience with IV’s over the years that administering fluids isn’t a scary proposition for me. So in with the IV so we could get some fluids into him. And then we wait. Meanwhile Biz is starting to feel better, the tranquilizer is wearing off, and the painkiller is obviously doing it’s job. Anybody who has ever tried to hold a bored horse still knows what I’m talking about. He’s tossing his head, trying to eat his IV bag and tubing, and generally making a nuisance of himself. But the fact that he’s feeling better is promising. Halfway through the fluids, he let loose an extra-runny, super-smelly diarrhea. YUCK! But if that’s what it takes, let ‘er rip! After his fluid cocktail appetizer session, I let him loose in his stall to see if he was still going to try to lay down. He stayed standing – excellent! He was very interested in dinner too, and the vet said we could give him a little hay if he was doing better. We put a half-flake in his haynet and watch. So far so good…. So now, I’m hanging out waiting until I need to recheck. I’m crossing my fingers that things are ok. I’ll need to recheck every 3 hours tonight, so I won’t be getting much sleep tonight. It’s like having a baby, except one that lives in a barn several miles from home on a below freezing night. At least the cold will wake me up! P.S. At the 9:30 pm check, Biz was standing staring at me when I walked in. He had eaten all his food, and was looking pretty perky. He had good bowel sounds, albeit a bit growly-bowly (yes, that is a technical term), and no new diarrhea. Hopefully he’s doing as well in 3 hours. P.P.S. At my 1 am and 4:30 am check, Biz was much more comfortable and perky. His bowel seemed to be settled, and no new diarrhea. Hopefully the worst is over! Shhh… Don’t tell Jon…. He’s at class tonight for his weekly marathon evening of class. 6 – 9:30. Ugh – I remember when I was in school. But that’s not the secret. I’m supposed to be folding laundry. But instead I’m watching Antiques Roadshow and drinking a glass of 2006 Matthews Estate Claret. I had a long day at work, went to get gas and to the grocery store, and then made dinner. I didn’t get home until 7 tonight, so I’m going to relax a little bit. This wine is mostly sold out, but we found a couple bottles the last time we were at Costco. The Claret is a Bordeaux blend, but the winery doesn’t advertise what the blend is. For a red, it is lightly oaked, with a rich taste of blackberry and espresso (or is that tobacco?) According to their website, it is both. Whatever it is, it is delicious, with excellent balance and structure. 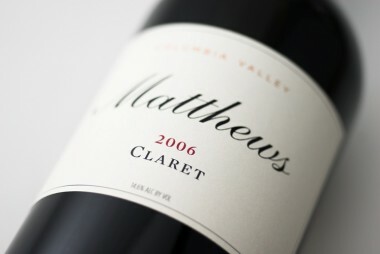 Jon and I were first introduced to Matthews Estate when Jon’s uncle took the family on a Woodinville wine tasting tour. We’ve been back once, and it was just as good the second time around. I also love their Sauvignon Blanc. The winery has a small tasting room with a large barrel room which they open up for special events. The staff are friendly and love telling you about their wines. That always makes the winery experience so much better. Well, I’ve got to get back to the laundry, but I will enjoy my wine!